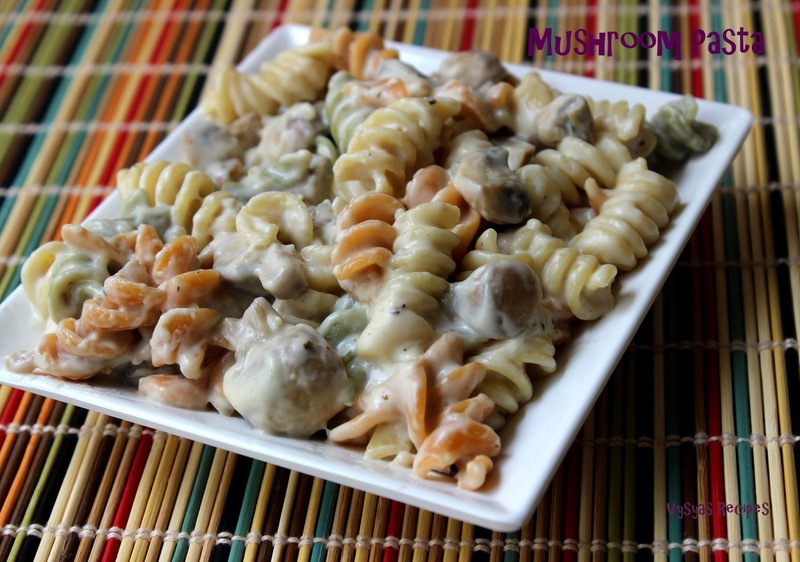 Mushroom Pasta is made with Button Mushrooms in Creamy White Sauce.Mushrooms when blended with white sauce Pasta, tastes awesome.I used Tri colour Rotini Pasta for this Recipe.Mushrooms are an ideal low-energy diet for diabetics. Mushrooms have no fats, no cholesterol, very low levels of carbohydrates, high protein content, and a wealth of vitamins and minerals. They also contain a lot of water and fiber. Moreover, they contain natural insulin and enzymes which help the breaking down of sugar or starch in food. Mushrooms are a rich source of calcium, which is an essential nutrient in the formation and strength of bones. Now we learn to make Mushroom Pasta. crushed Pepper/Pepper Powder - As per taste. All Purpose flour/Maida - 2 tbsp. Oregano - 1 tsp. (for Garnishing). Take the water in wide vessel and bring needed water, to rolling boil, then add Pasta, cook till pasta is soft and firm. stir now and then, to avoid pasta gets sticking to a vessel. Then drain it in a colander, and Pour cold water over it, to avoid it getting cooked further. Take a bowl, add mushrooms and 2 tbsp of Maida/All purpose flour, mix well. Make sure that flour coats well in Mushrooms.Then add needed water to it , rinse the mushrooms, then change the water, again rinse it, drain the water completely and cut into desired shapes. Clean the Mushrooms and cut into desired shapes. chop the onions and garlic, and keep it aside. Heat the butter in kadai, when it melts, add Garlic.When Garlic turns golden brown colour, add onions. When onions turns golden brown colour, add Mushrooms. Saute mushrooms.Mushrooms oozes water. When mushrooms are completely cooked, and water oozed by it,is completely absorbed, add Maida. saute it. Make sure that mushrooms coats well in Maida. Add 1 + 1/4 cup of Milk.keep stirring, till it coats well with ladle, as shown in the Picture. Add Cooked Pasta,crushed Pepper & salt. Mix well. Add Remaining Milk, mix for few seconds, till it gets creamy consistency. Garnish with Oregano .Top it with Grated cheese. you can add veggies like carrots or capsicum before adding mushrooms. I used tri colour Rotini Pasta, you can use any pasta type. I used crushed Pepper. you can use Pepper Powder also. I used 2 cups of milk, you can adjust the quantity of Milk, as you desired. Back after a vacation…Missed a few posts.....will catch up!! Pasta looks delicious!! Rich and super delicious Pasta dear!